Nothing says fresh and zingy like passionfruit. 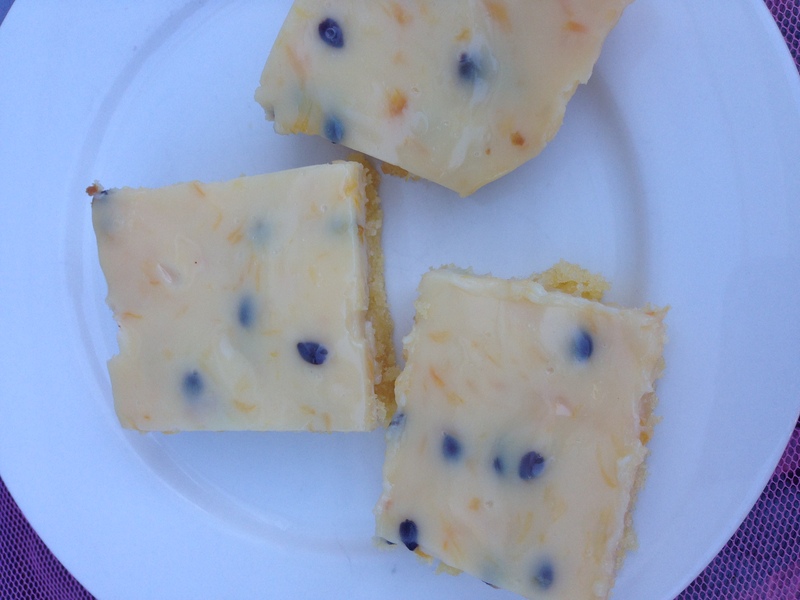 Those who know me know that I have a dislike of fruit bordering on the pathological but for some reason I do enjoy passionfruit in baked goods. 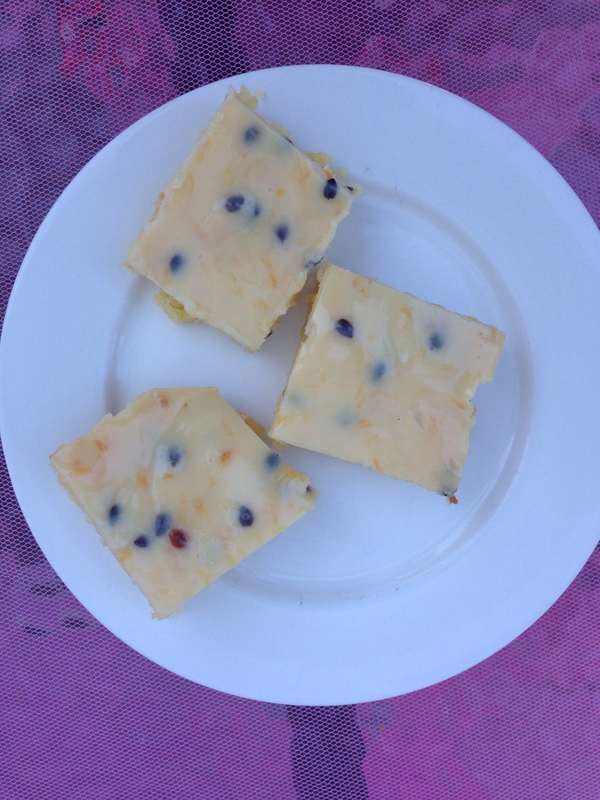 Misses 6 and 8 are my opposite – they adore fresh fruit, but actively dislike passionfruit in baked goods. Sigh. Anyway I had some passionfruit going begging and decided to whip up this easy peasy recipe on a Sunday afternoon. 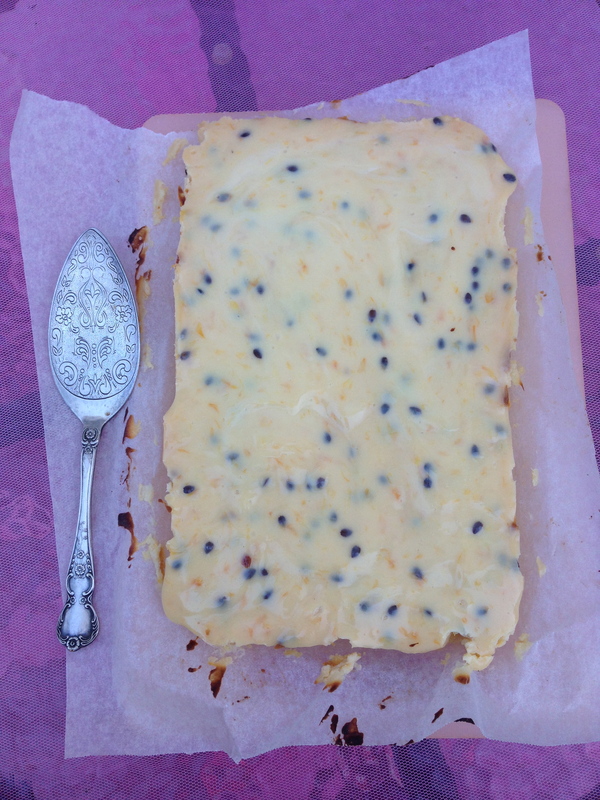 Miss 6 took exception to this, bemoaning her hatred of passionfruit in cakes & bickies… until she tried it. Of course she loved it. See, Mother really does know best. Preheat oven to 180C and grease and line a slice tin approx 18cmx22cm. In bowl of electric mixer beat butter, vanilla and sugar until creamy. Fold in combined flours and milk. Scrape into ban and smooth using a palette knife. Bake for 15-ish minutes, until pale gold and cooked trough. In a large bowl whisk together the condensed milk, lemon juice and passionfruit pulp together. Pour or ladle over the base and bake for another 15 minutes. Cool on bench, then place in fridge for another or so. When cold cut into bars. I love passion fruit. I will have to try this recipe as soon as I get my mitts on some. I’ve never seen tinned passion fruit. I will have to take a closer look in that aisle of the store. Then you’ll love this – has a great, fresh zing! wow–this looks dee-lectable 😀 No fruit for you, though, huh? Is it the flavor or texture? I like fruit, though not usually in desserts. Your bars I would make an exception for! Hi, I just nominated you for the One Lovely Blog award. It’s really a way to showcase yourself and pass it on to other bloggers who have touched you in some way, and a great way to direct your readers to and bring attention to a blog that you love. Iconic – I like it! Thanks! 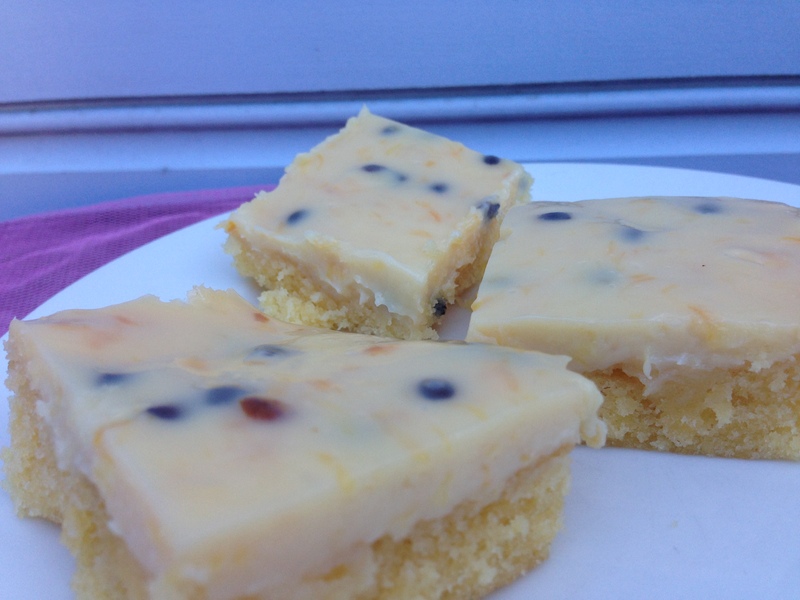 Seeing that it’s passionfruit season here in Manila, I am definitely grabbing a basket of fruit and baking these! Can you get the pulp in tins where you are? Because that works perfectly well in this recipe. Ooh, that looks wonderful! I like the use of adding an exotic fruit like passion fruit! I must try this soon. Oh, this looks fabulous! Thanks for posting the recipe!! 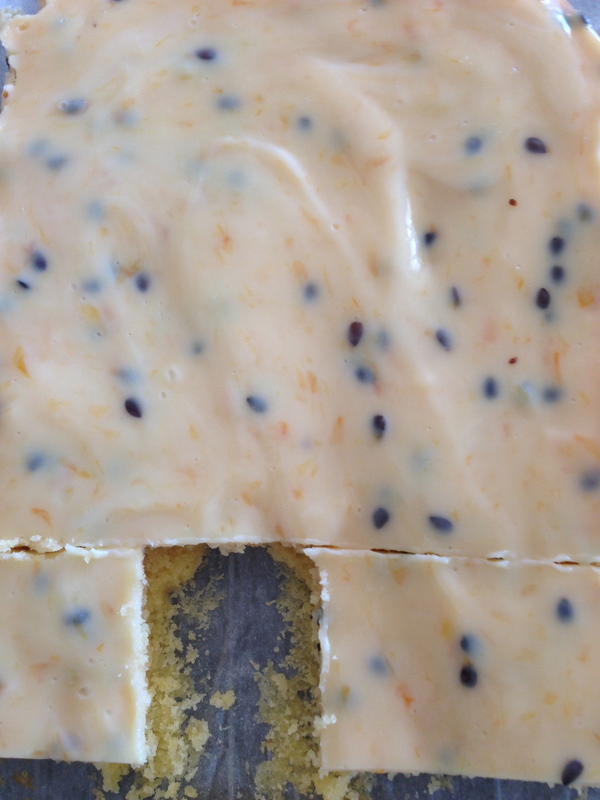 i’m a huge fans of tangy passionfruit, your bars looks damn delicious!!! I love passionfruit anything! Would scoff these unconditionally for afternoon tea, morning tea, late night snackage, yup! Unconditional love for passionfruit, eh? That is dedication! These look fabulous! Love passionfruit. awwww, ta. Passionfruit helps cut the richness of the base here. Looks divine…and I imagine such a great taste. Happy Nesting.